Working together with surrounding United Ways, the new ALICE Report was just released by The United Ways of Florida’s central west coast (Citrus, DeSoto, Hardee, Hernando, Highlands, Hillsborough, Manatee, Pasco, Pinellas, Polk and Sarasota counties) on February 6. You may have seen some of the news coverage including the Times, Sarasota Herald Tribune, Bradenton Herald, ABC7, ABC Action News, Telemundo and more. ALICE (Asset Limited, Income Constrained, Employed) households earn enough to stay above the poverty line, but struggle to pay for basic needs like housing, food or child care. The latest report details that 43% of households fall below the ALICE threshold. Not only do they struggle to cover basic needs, but they are unable to set up any emergency savings and are vulnerable to unexpected financial setbacks. Visit www.walkwithalice.com to simulate the decisions ALICE makes daily. We saw the precarious state of ALICE during the recent government shutdown when many contract employees and government workers went weeks without a paycheck. Missing one paycheck caused tremendous hardship and sent finely balanced budgets down the tubes. Challenges as simple as gassing up the car to get to work the next day, to paying for childcare to be able to work, to shopping for groceries, to juggling credit card and utility payments added a tremendous burden for these workers when the expected paycheck didn’t arrive. Fortunately, United Way Suncoast was there to help thanks to you. Partnering with Tampa International Airport, Feeding Tamping Bay, 2-1-1, utility companies and more, we were able to help bridge the income gap they were experiencing through access to food, assistance with utilities and rent, support for child care and more for those who needed a helping hand. While the government shutdown ended, and workers are getting caught up on their bills, the need continues for others in our community. 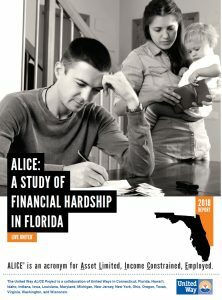 There’s no simple solution to this problem, but United Way Suncoast will continue our work to help create a more financially stable future for the ALICE population throughout our region.